Verizon Communications Inc. (VZ), through its subsidiaries, offers communications, information, and entertainment products and services to consumers, businesses, and governmental agencies worldwide. Verizon raised its quarterly dividend by 2.10% to 60.25 cents/share. This was the 12th consecutive year that Verizon’s Board has approved a quarterly dividend increase. As a result of the track record of consecutive dividend increases, Verizon is a member of the dividend achievers index. Between 2007 and 2017, earnings per share grew from $1.90 to $3.26. Earnings per share for 2017 were adjusted to exclude the impact of the 2017 tax reform. The company is expected to earn $4.66/share in 2018. 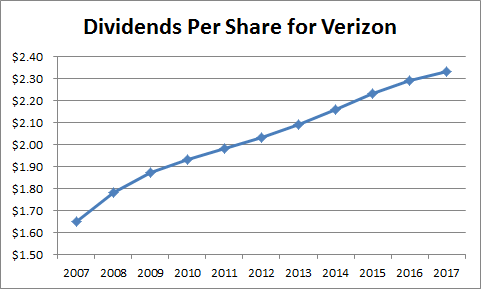 Over the past decade, Verizon’s annual dividends per share rose from $1.65 in 2007 to $2.33 in 2017. At the current rate of 60.25 cents/quarter, the annual dividend comes out to $2.41/share. Based on 2017 earnings per share, the dividend payout ratio was at 71.40%. Using forward earnings per share, the payout ratio looks even more appealing at close to 52%. 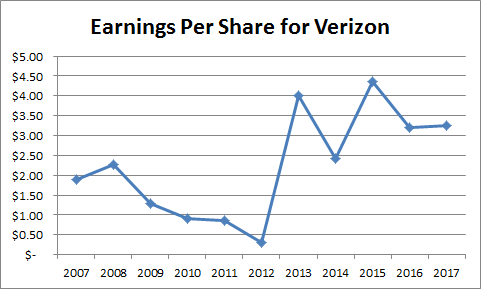 I believe that Verizon’s dividend is safe. I like Verizon as a long-term holding, but I would prefer it at an entry yield that is closer to 5%. For some reason I prefer Verizon to AT&T. Perhaps the reason is that their non-core acquisitions have been on a much smaller scale than those of AT&T. I was hopeful that the proposed Sprint/T-Mobile acquisition would spook telecom investors into panic sell mode that would push prices lower. Unfortunately, this has not happened so far. I am monitoring the situation however. A stock like Verizon will not make you rich overnight. This is a slow and steady dividend payer, which would provide some extra current yield for a portfolio, as well as some stability during turbulent times. I would not expect large dividend increases in the future either, as the company is working to reduce debt, and invest in the business, while still providing dividend increases to shareholders. The telecom business is highly competitive. However, companies like Verizon have the scale to build a quality network across the United States, which is customers like ( as evidenced by the low 1% churn rate). There is a lot of investment that has to be made to maintain and upgrade the network, since technology doesn’t sit still. When you have 126 million customers however like Verizon does, you have the scale to efficiently deploy new technology like 5G and a cheaper per customer cost than competitors. Right now Verizon is attractively valued at 11.60 times forward earnings and yields 4.50%. I would prefer the stock closer to an entry yield of 5%, given the slow rate of dividend growth.